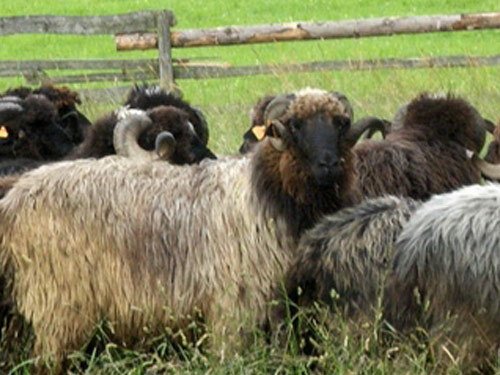 Polish Mountain Sheep evolved from the old Carpathian Cakiel, and especially one of its varieties - the primitive Podhale sheep. They can be found in the whole Polish part of the Carpathian mountains; however, they are most frequently found in the Podhale region near the town of Nowy Sacz, where the breed traditionally originates. They have a light build, thin but strong legs, and narrow rump. Polish Mountain sheep are milked. The milk yield is 50 to 100 liters per lactation and 40 to 80 liters in a milking period of 150 days with a fat content of 7 to 8%. Meat production is rather poor. The wool is white and coarse, suitable for carpet manufacture. The thatch-like coat consists of loose locks, with a characteristic parting line along their back.